Dr. David Oyedepo, a minister and prophet of God in Ogun State, Nigeria, recently addresses a graduating class from the church’s university. In that address he stated that the greatest obstacle facing our youth today is bad company, which, considering the great evils of the day, is a profound statement. Pastor Oyedepo told the story of a goat and a dog that were raised together. These animals are very different in nature, but because the goat was raised with the family’s dog something very strange happened. Most goats never are named. They won’t come when called, so there’s no reason to name them. But this goat, named Beauty, began to come when called by it’s name. It would also wag it’s tail like the dog. It would eat meat like the dog, which is contrary to the very nature of the animal. It would follow its master around, and in all ways began to act like the family dog. The influences of those around us do change who we are. It’s very hard not to become like the company we keep. It’s also easier to be pushed down into the mire of worldly living than to be pulled up to Christian living. Sin is our human nature even after we are saved by God’s grace. That nature can be so easily aroused by the company we keep. But there is a way to fight this change and become victorious. A submarine can travel deep under the water’s surface where the pressure of the water would typically crush a diver. It does so by using the principal of displacement. 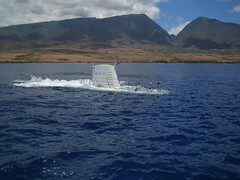 In order for the submarine to descend into the deeps of the water, it must be filled with air pressure equal to the pressure of the water around it. The pressure within the submarine’s capsule gives its hull equal strength to the pressure of the water outside the vessel. Likewise, as Christians, we carry a displacement for the pressures of the world. The Holy Spirit within us gives the strength we need to endure the depths of this world’s sins. But be warned my friends! If you fail to empower the Holy Spirit within you, you will be crushed by the world’s pressures and temptations. This kind of displacement is done not with tanks of air, but with prayer and God’s word. Be sure His Spirit has displaced the evil around you before you descend into the depths of the world, or you will be crushed! Submarines used in warfare often find themselves under fire from the enemy. When this happens, and they see that they are in danger, they begin to flee the depths and rise to the water surface. Never take on a battle of temptations that you cannot be assured to win. God gives a chance to escape each and every temptation. In 1 Corinthians 10:13 we read “No temptation has overtaken you except such as is common to man; but God is faithful, who will not allow you to be tempted beyond what you are able, but with the temptation will also make the way of escape, that you may be able to bear it.“ Take that moment God gives you to escape and run! There’s nothing wrong with showing a little cowardice when temptations are at hand! It is better to end a cowardly victor than a slain soldier!